Most BI tools try to replace Excel. XLCubed extends it, giving unrivalled flexibility with reduced training requirements. We work in a data-connected Excel environment power users are comfortable in, addressing PivotTable restrictions and with straightforward web and mobile deployment. The result is the sophistication of a bespoke BI tool, augmented with the flexibility and familiarity of Excel. Business users quickly become highly productive, and have control of their reporting and analysis needs. IT can then focus on the data platform rather than responding to adhoc business reporting requests. 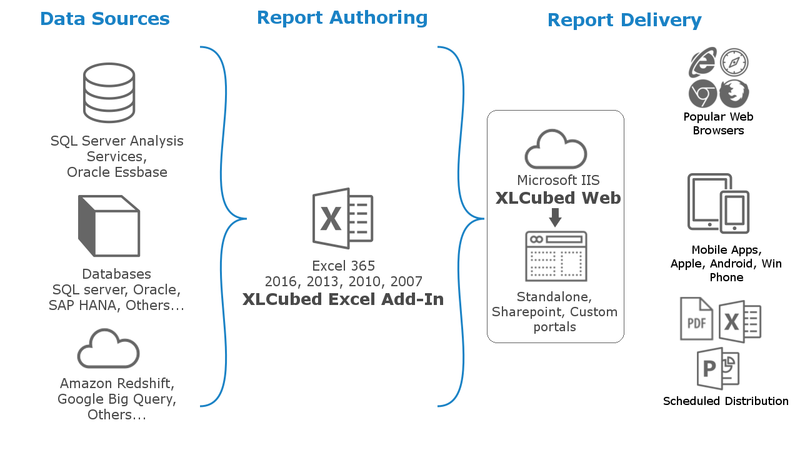 XLCubed’s BI focus mixed with deep Excel integration gives huge flexibility in all aspects of reporting and analysis. Users can quickly explore and understand their data with slice and dice and flexible level and descendant-based selections. Calculations are simple to add, but fully data-aware, handling drill downs and hierarchy repositioning. Disparate data sources can easily be linked together through data-mashups, or with intelligent slicers. Numbers can be quickly broken down to their constituent parts, and data can be explored visually through interactive charting. Non-technical business users can develop reports in the Excel client, and quickly share these securely across the organisation. Any XLCubed report, dashboard or piece of analysis developed in our Excel client can be published to XLCubed Web with just a few clicks. Published reports remain data connected and interactive, and respect corporate security. Reports can be accessed through our standalone portal, our mobile apps or embedded seamlessly in SharePoint or custom websites. Reports and dashboards built in XLCubed Excel can be published to remote mobile users in seconds. Our Report Viewer apps for Apple and Android devices give interactive access to reports published to XLCubed Web. Analysts and power users can work productively in their preferred Excel environment, building multi-sheet reports, and responsive dashboards for use on the tablets and smartphones of senior management. The model provides an efficient way for business users to leverage their existing Excel skills to deliver best of breed mobile reporting. The XLCubed Mobile App is available in Apple's Appstore, Google play and Amazon as a free download. It ships with a pre-set connection, and some sample reports. Connect to your data. Design your report. Publish and distribute.